I love overnight bread. It’s much easier to make than normal homemade bread, without any kneading necessary – you just mix everything together in a bowl, let it sit overnight, and then bake it in the morning. The thing is that it’s usually baked in a dutch oven or lidded ceramic dish and involves some dough folding and sitting in a tea towel in the morning after it’s risen overnight, which I find detracts a bit from the simplicity of the method. This recipe is a little bit different. It’s about as hands-off as you can get from bread making (other than picking up a loaf at the store and pretending you made it). The only thing you need is a few minutes to mix everything, and the bread does all the work on its own. This does require at least 12 hours of rising time, though, so I recommend that you make it in the early evening as opposed to right before bed. The dough rises a second time in the pan you bake it in, so you don’t need to worry about proper folding technique or anything like that. All you have to do is mix it the night before, dump it in a loaf pan, and bake it. No kneading, no folding, no special equipment. Despite the lack of work that goes into this bread, the crust is surprisingly crispy, and the inside of the loaf is soft and tender. This bread lasts longer than other homemade breads, and it keeps for at least a week sitting on the counter, wrapped well. If you’re familiar with traditional dark rye, this tastes just like it. 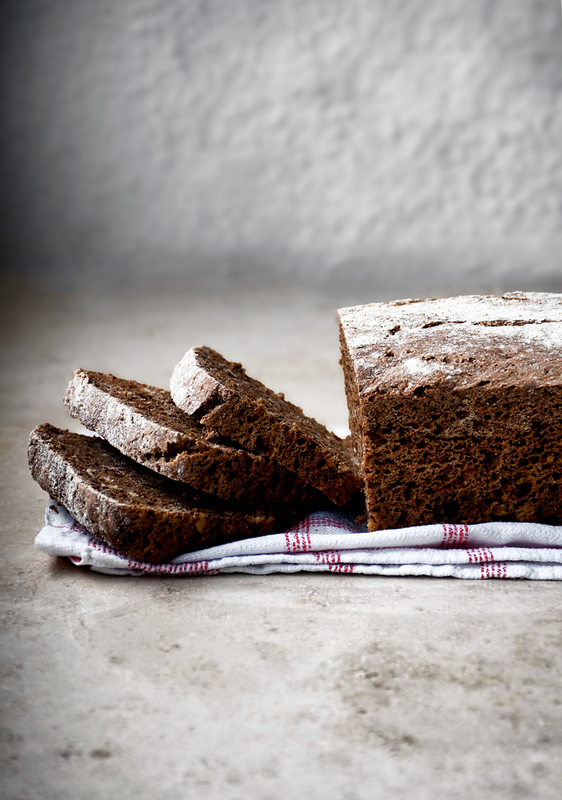 If you’ve never had it before, dark rye is a commonly eaten bread in northern Europe and Scandinavia. I live less than an hour from the north sea now and just a couple of hours from Denmark, so the food here is very similar to Scandinavian food. The bread is quite dense and filling, and its flavour is reminiscent of sourdough because of the long rising time. It’s often eaten as a breakfast bread with different spreads or used for sandwiches, usually open-faced. I happily eat it for breakfast or as a midday snack with some peanut butter or jam, and Graham will eat half a loaf in a day. The dark colour comes from a little bit of cocoa powder and whole grain flours. On another note, I made my fig and hazelnut cake today for some students at a jewellery making workshop, and it went over really well. I changed the figs out for halved apples and added cinnamon to the batter. I also made a deal with the owner of the studio, one of my grandmother’s friends, to teach me jewellery making in exchange for catering when she has groups of people there for courses or exhibition openings. Update July 11, 2017: The recipe has now been updated to include measurements by weight, and includes instructions on how to make it with a sourdough starter in addition to commercial yeast. 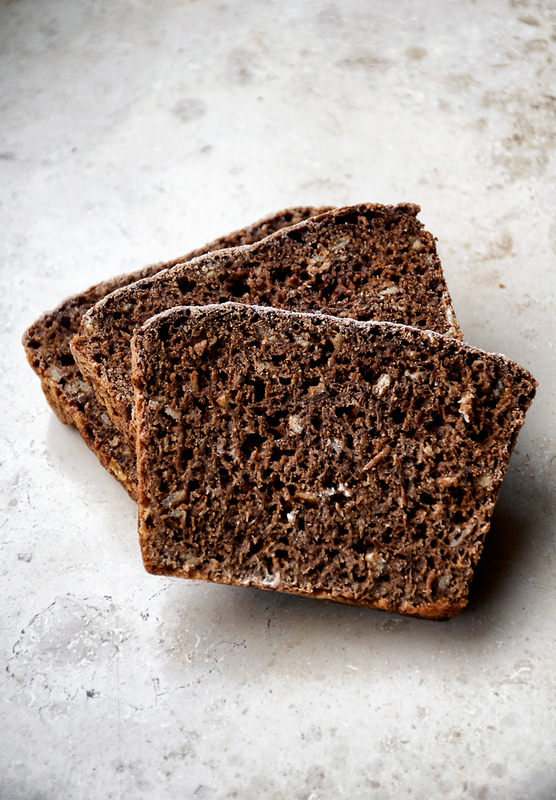 This overnight rye bread is an easier version of a northern European classic, made with whole grain spelt and rye flour, cocoa, and oats. This dense bread is not at all dry and makes a nice alternative to light loaves, with a stronger flavour and slightly chewy texture. In a large bowl, combine the spelt, rye, oats, cocoa, and salt. Add the dry yeast to the dry ingredients as well if that's what you're using. If you're using fresh yeast, stir it into the water with a fork to dissolve it before adding it to the flour mixture. Add the water and maple syrup/honey to the dry ingredients and stir to combine. The dough will seem wet and shaggy looking, but that's good. Cover the bowl with a lid, cutting board, or plastic wrap and let it sit for 12-15 hours at room temperature. It will at least double in size during this time. In the morning, grease* a 30 cm / 12 inch bread pan or line it with paper. Scrape the dough into the pan, and then press it down evenly with wet hands. Sprinkle flour overtop and cover with a clean dish towel. Let the dough sit for 1-2 hours at room temperature. Heat the oven to 200C / 400F. Once the oven is hot, place the bread on a middle rack and bake for 40-45 minutes. The crust will be hard and sound hollow when tapped once the bread is done baking. Remove it from the oven and place the pan on a metal rack to cool for 20-30 minutes before removing it from the pan to cool completely. The loaf will keep well for a week at room temperature, stored in a bag or plastic wrap. • To make this bread with a sourdough starter, simply stir in 1/2 cup / 140 grams of your starter to replace the commercial yeast. It will take an additional few hours before baking, but it depends on the heat of your home. I usually mix it about 24 hours before baking. Follow the other directions as written. This is my standard now when making this bread and the results are virtually identical. 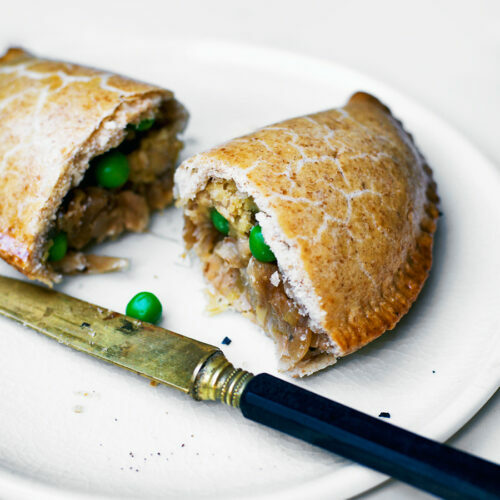 You will get a more sour flavour and a more noticeable oven spring using a starter. * If you grease the pan, it might seem like your bread is stuck to it. Don't worry, it's likely that just the very top of the loaf is sticking slightly to the very top of the pan (where it might not have been greased) and all you have to do is gently lift with your fingers or a butterknife. The bread should pop out of the pan easily if you pull the sides slightly and tap on the bottom. I've made this bread several times and haven't had any problems getting it out of the pan. This bread looks fantastic and your photos are stunning as always! I'm not too sure exactly where you're living currently, but it sounds like a fantastic experience and I love that you're sharing inspiring food from there. Thank you, Samantha! We're in Germany now 🙂 it's lovely being in a different food landscape. My parents being German, I (naturally) grew up on lots of homemade bread. From sourdough to dark rye bread. I love a good hearty bread and still dislike what passes for bread here in Canada. If you can sandwich the bread thinner then a piece of paper it should not be considered bread! looks amazing! my fiance's favourite bread if rye so he will love this. Exactly, Markus! Haha I was always appalled by squishy white bread! Thank you, Sofia! No, I don't think the chocolate is really noticeable – it just adds a little dimension and makes it a bit more rye-tasting. Ugh it took me three weeks of babying to get my sourdough starter going! The guidelines I followed said it would take three days, ha. Hi Alexandra! I discovered your blog through Food52, the cleaned up coconut bread recipe (which is fantastic). I've made this bread today, replacing whole spelt flour with whole wheat one since I didn't have any on hand. The loaf is not sour at all, I let it sit for 14h, and room temp is around 20C. Do you have any idea how I can increase the sourness? Goodness, I'm so surprised! I'm happy to hear that you like the coconut bread recipe. Hmm, well this bread definitely doesn't taste as sour as a true sourdough – the goal is more to make the bread easier to digest so that you can absorb more of the nutrients without having to worry about a sourdough. That being said, I have made this bread several times as a true sourdough and it's excellent. To make it really sour, replace the dry yeast with 1/2 cup sourdough starter. Let the bread sit out at room temperature overnight, and then refrigerate it for a day and another night. The following morning (36 hours later) push the dough down into a loaf pan and let it sit for a couple of hours to come to room temperature. Bake at 475F, reducing to 425F 15 minutes in, and bake until it sounds hollow when tapped (sorry I haven't written the exact time down). It should rise really nicely and have a good strong sour flavour. I hope that helps! Super amazing! 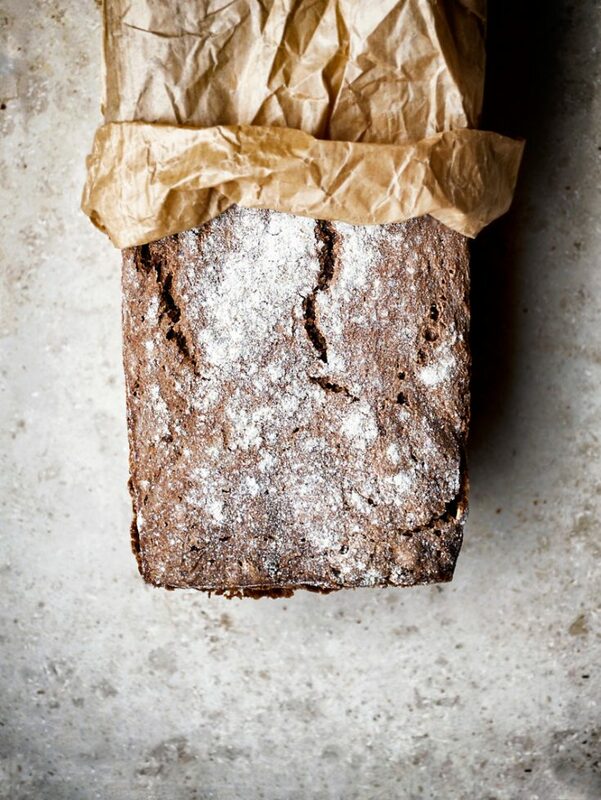 So absorbed in the flavor of rye flour, definitely going to try it this weekend! Thank you so much for this amazing recipe!! I baked this at the weekend and me & my boyfriend loved it – so easy and it looks really impressive too! So glad you liked it! It's a staple in our house, I make one every couple of days now. So happy to hear it! It definitely doesn't rise as significantly before baking as a regular white bread does, but it's meant to be a dense and hearty loaf 🙂 I'm thrilled that you liked it, especially as an Austrian who's used to dark rye! I can't wait to try this after reading the instruction and even more so after reading all the comments. I love to bake breads, but have never tried rye. I have some rye flour and whole wheat, will try it that way as one other said she did until I get some spelt flour. I belong to a food coop and I know they carry it; now I know what I will be ordering next month. Thanks, this sounds delicious. Do you have a scaled (weight) version to share? The bread looks delicious! Hi John! I'll be mixing another batch tomorrow morning, so I'll update the recipe then with the necessary weights. Thanks for your kind words and I hope you like it! Thank you, I look forward to trying it. Thanks for the recipe in weights. I made it yesterday and had some for breakfast today… Wonderful! It reminds me a little of the rye recipe in "In Search of the Perfect Loaf", which is my favorite bread, and which I always try to keep on hand. I may alternate with this bread now. I used a 9 inch pullman pan with no top, and it fit nicely. I wish I had docked the loaf before baking because it split along the tip/side. I used 100g sourdough instead of yeast, and followed the recipe closely. The oven spring was amazing; I cooked it in a Breville toaster oven and the bread pretty much maxed out the available headroom. The flavor is complex and lingering. I like it with warm cream cheese and chopped scallion and jalapeno (a few slices of which were breakfast today). Even though the flavours were great mine came out reLly doughy and wet inside. ….. any idea why ? Hi Jon! Thank you for such a thoughtful comment and I'm so happy to hear that you liked the bread. There are a couple of issues that might result in a wet bread – most likely it's undercooked. Ovens vary greatly in temperature so a knock to see how the bread sounds is usually a reliable test to see if it's fully baked (it should sound hollow). If you're sure that you followed the recipe exactly, it could also be due to humidity levels, but I think the most likely answer is under baking. This is a bread that can handle a looong bake time so if you think your oven might run a little cold, feel free to bake for an additional 10-20 minutes. I once forget about a loaf and left it in the oven for 2 hours, and it was still edible, just with a thicker crust! I hate rye bread in America, but that might be due to the seeds the add to it which are very bitter and just gross IMO. Is this bread similar to the kind I've tried? Can you describe the flavor profile? I wouldn't compare this to North American rye bread. It's Scandinavian, vaguely molasses like perhaps? Not at all bitter but certainly a little sour from the fermentation process. It ends up being a touch sweet in my opinion but quite deep in flavour – I don't think it's bitter but it's no babka. I'm not sure if you're thinking of American rye bread that's light, though, what's called rye in Canada? They're very different than northern European rye. If you've ever had German black bread this is a bit more like that, but more on the bread side of things with a greater rise. Thanks for getting back to me so quickly! Another question, if I don't have the or spelt flour can I use whole wheat? I know the taste wont be the same bit will the recipe still work? And can I make it without the oats too? I had the most amazing dark rye in Estonia, and I've been craving it ever since. Haven't found any to buy in Australia, so I was thinking I'd try making some. This recipe looks perfect for just that! Easy, and so many happy commenters! This was the first time for me to make bread! It is delicious! I was very hesitant when I had initially mixed the ingredients together, looking so ‘glunky’ and all. After 15hours it had doubled in size, looked better – but then once transferred to the pan for another couple of hours I was amazed at how much more it doubled in size! It didn’t rise much in the oven, is it possibly because of the pan I used wasn’t deep enough? Regardless, it is a dense bread – soft on the inside with a nice crusty outside. Will make again! Yum! I’m so pleased to hear that, Skye! It generally doesn’t rise too much in the oven, it’s meant to be pretty dense in the end. I’m happy you liked it 🙂 and thank you for your note! I’d love to give this try! Have you tried including dried fruit and seeds? I’m keen to find a low-fuss fruit loaf that keeps well. Thanks for your great recipes and blog posts! Can white whole wheat flour be substituted for spelt flour? I think that would work! I haven’t tried it, but it should be fine as they have about the same level of gluten. Thank you so much for this beautiful recipe, I made it the other day and it was amazing! I cook in a romertopf which helps keep the outer crust super crusty. 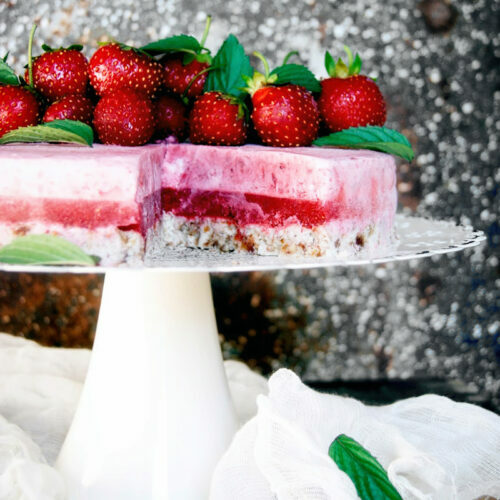 Your site is as beautiful as it is full of delicious recipes and I look forward to sharing more of these with friends and family! Thanks for posting this recipe. I am in the pursuit of recreating a bread I buy when in Michigan. The bread is a spelt bread. Similar recipe except calls for yukon potato and no cocoa. 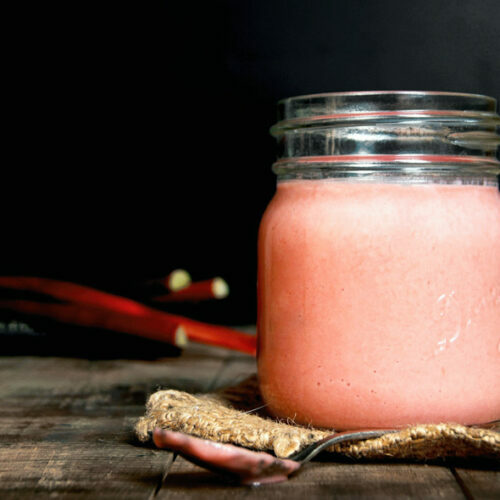 Any ideas on how to tweak the recipe in that way? Hmm, I’m not sure – but this is something I’ll work on this week and let you know (maybe a new recipe).